Dine & dash + Deadites = gore galore. *Fisher & Ruby arrive at El Brujo's while the funeral pyre is still burning. Deadite El Brujo's skeleton rises from flames to attack Fisher, and when Ruby uses a scythe on him he calls her a double-crosser, says "The others will never let you get the Book for yourself. And neither will I!" and pulls her into the pyre where they both disappear in the explosion. *We meet Ash's acquaintance, Lem, who tells Ash the location of a prepper militia. Lem ends the episode screaming in the woods, but no doubt he or his militia arsenal will be back soon. *Pablo tells Kelly about Eligos-in-Kelly's seduction/murder attempt, hoping that some of the seduction came from Kelly, but she tells him it must have been all Eligos, since she could never see Pablo that way since he's so sweet and pure. *The Book and El Brujo's pendant have a strong attraction. *Mass carnage at the Moose Lounge including death by ice skate, ceiling fan, and deli slicer. Fisher joins Ash, Pablo, and Kelly on the journey back to the cabin to destroy the Book. The death by ceiling fan was completely unnecessary and ridiculously over the top, so perfect! I loved it. The murder spree in the Moose Lounge really saved an otherwise dull episode. 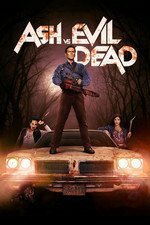 My favorite line this time was probably: "What, never seen a guy with a chainsaw hand before?" This was some classic Raimi gore, particularly the ceiling fan and the deli slicer. I loved it. The burning skeleton was the first effect that this show has done that absolutely did not work for me. That was some seriously mid-90s CGI. Lawless should have been dressed as Xena to fight it. I read the AV Club recap, and had to make sure nobody missed this. I'm just curious to know how she got the Kandarian dagger/became known to the Deadites without the Necronomicon. I guess maybe the professor had other books & research that led her? I know we'll see her again, but not until the finale I think. I was curious about the actress who played the waitress, if there was some connection to previous Evil Dead or Raimi/Tappert production, but I'm not seeing it on her imdb page aside from it being mostly New Zealand productions. Maybe a Michael Hurst connection. I know we'll see her again, but not until the finale I think. Man, I hope it's sooner. Maybe a Michael Hurst connection. As it turns out, your hunch is correct. She was Esther in a production of Twelfth Night that he directed. Good catch! This episode hit a sweet spot for me. Ash eating the pancakes was hilarious for some reason, and him saying "and I would have to cut your heads off, nobody would be happy with that" just killed me. Also, while I liked the death from the ceiling fan, the meat slicer/tenderizing hammer was the best in my eyes. They also both did "Legend of the Seeker" and "The Almighty Johnsons" - not the same episodes, but there might be some casting agents in common, I imagine the New Zealand acting community is relatively small-town-ish. I wasn't expecting the carnage, but I had a feeling watching her that there was something significant about her. Like, how in horror movies there will be a shot of a character at the edge of the frame, with a big empty window taking up the the center of the screen and you just know that something's going to smash through the window. Or seeing Pat Tallman pop up as a minor character/extra and knowing that a stunt was likely coming. I don't see anything in her bio about her being a stuntwoman, but Hurst must have known she could handle the make-up/action. Great return to bloody form! Soundtracking remains strong, impressed hear to Death's "Freakin Out" for the diner fight, effing perfect. I am super late to this -- just got around to watching it -- but I have to echo the praise for the final bloodbath. I was cackling with absolute glee while I watched. This show is just so much fun.